Purple was the color of the first dye made by man. It was called "Mauveine" and was made out of coal tar. The recipe was discovered by William Henry Perkin in 1856. Purple was the royal color of the Caesars. The purple in the U.S. military Purple Heart award represents courage. Purple represents the planet Jupiter. Purple is representative of "pride" in Christianity. February is the month associated with the color purple and the birthstone for those born is February is amethyst. So I looooooove purple and was dreaming of food in purple and here goes my purple creation just for you. Wash and soak rice in water for a while. Dice onions into small pieces and split the green chillies. In a pressure cooker, take few tsps of oil or ghee and add the spices. Fry for a min and then add the ginger garlic paste as well as the diced onions and chillies. Saute for a few minutes. Dice cabbage roughly and grind in a mixie into a paste by liberally adding water to it. Now take three cups of the ground cabbage and water mixture and add it to the pressure cooker. Drain the soaked rice and transfer it to the cooker. Close the lid and wait till steam comes. When it starts to steam, open the lid and add salt. Mix well and close it again. Wait for two whistles. Serve it with onion raitha. I have used 1:3 ration of rice and water. Adjust this according to the rice variety you use. Add some white pepper if you love your rice spicy. Looks wonderful.. shall be back to see other colours too.. 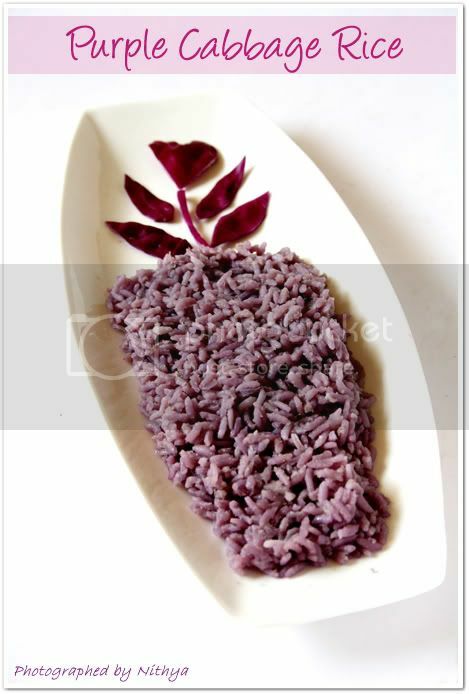 Colorful rice...havent tasted purple cabbage yet...urs look tempting.Nice facts abt purple! Nice work Nits..Waiting for other colorful creations..
Love the colour...and purple is my favorite colour. Colorful rice..very creative...eagerly waiting for more colorful and yummy dishes. Loved your neat n cute presentation da. Wow colorful rice and beautiful presentation.. I always have a look at the purple cabbage when i go for grocery shopping, but never dared to buy one since i did not have a good recipe. your rice seems very inviting and sure should have tasted delicious. will try it soon.. I also got purple cabbage last week...now i m thinking to give ur recipe a try. Nithya, wonderful idea. What a presentation. Simply beautiful !!! Loved this post a lot. My first atlas cycle was probably red and silver! LOL! 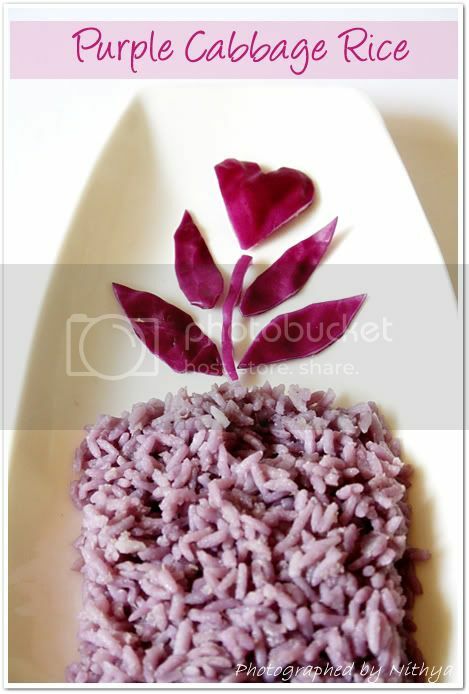 Love the purple cabbage rice - good theme! Let me guess what's coming up next? Pink pakodas or blue bhaji or green golgappas! Keep the creativity flowing! 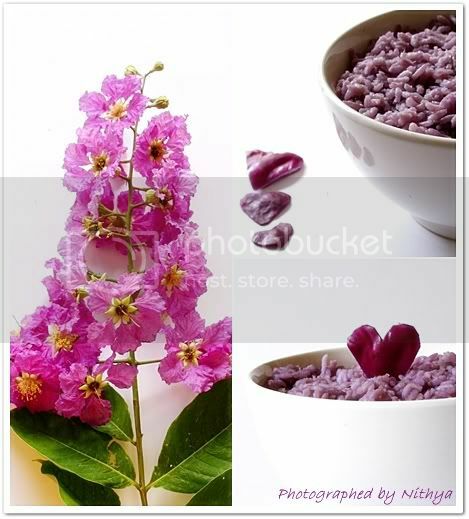 Wow great information about Purple color. Even I did not know about this fact of purple colour. Haven't tried purple cabbage yet. but your's making me tempted. Wonderful presentation as usual. Great Nithya!!! woooowww....I loved it! 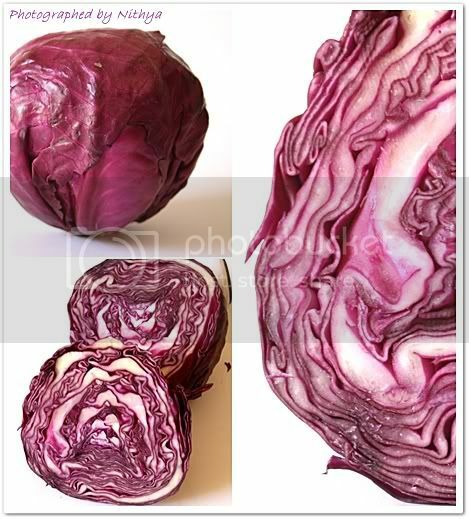 !nice pic buddy jaan....and nice recipe too....that reminds me, i never had purple cabbage ever in my life! 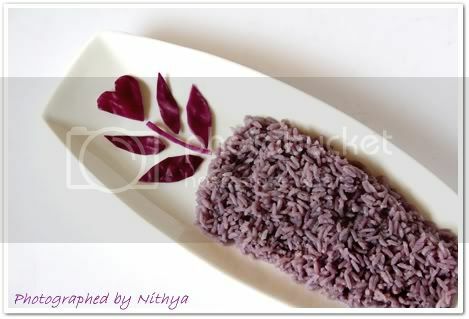 Brilliant pics, Nithya..Cabbage rice looks wonderful..
Wow! Beautiful Pics!Love the recipe and color!My Fav! nithya is getting ready with variety of variety rices to pack her hubby's lunch box..haahaa..awesome darling..
Waht am amazing colour this dish has produced.Looks superb awesome clicks and presentation. Ha ha nice color mania theme.. looks good nithu..